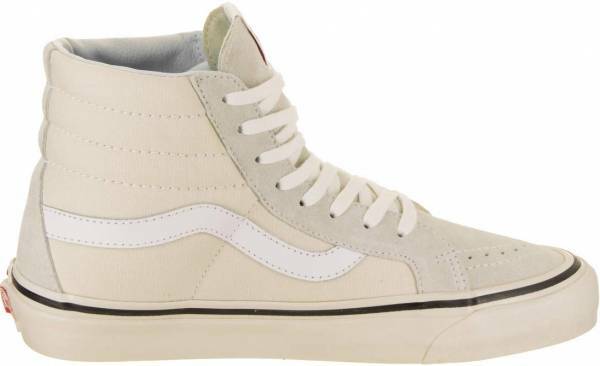 Almost everybody loved how vintage the style of the Vans Anaheim Factory SK8-Hi 38 DX looks. It is offered in superb colors which brings out the classic vibe to it. A reviewer highly commended the cotton laces which he even suggested to be used in all of the Vans iterations. The sneaker offers supreme comfort for everyday routines. Remodeling the SK8-Hi to its ancestor design instilled a high-quality build with majestic details. Several users receive compliments while wearing them. The sneaker exhibits supreme boardfeel and a lot of features adequate for skating. Out of all the shoes of one skater, this sneaker was the most memorable for him because it honors his hometown. The actual sneaker looks as good as the pictures when viewing it online. One buyer cannot stop wearing them. According to a few customers, the shoe needs to be broken in first. Few users find the SK8-Hi's to be non-durable shoes. The insoles are very flat and have no profile to them despite being thick and supposed to be comfortable. Paying homage to the place that started it all, the Vans Anaheim Factory SK8-Hi 38 DX gives a symbolic comeback full of intricate revamps. Giving the shoe its vintage shade, colorways of the sneaker embellish the silhouette with the right combination of tints to perfectly accentuate a fashionable style. Its no wonder why people would always look down on these shoes and give it an appraisal. To maintain its fresh and classic design, it is most appropriate to utilize the sneaker for streetwear instead of boarding even though it can be used for both. On March 16, 1966, a promising shoe manufacturer called the Van Doren Rubber Company established their first shop that would cater to a variety of flat-soled shoes. The shop was located at Anaheim, California which was the newly acquired home of our protagonists namely Paul and James Van Doren with the help of two of their friends. It is here where they found out that the secret to the success of creating a sneaker trend, was on the feet of skateboarders. After decades of ups and downs, their loyalty to the skate inspiration was never shaken. Vans had introduced numerous versions of skate sneakers through its historical career. There was the Authentic, which was the core style where the Era and Old Skool were sourced out. Then there was the high-top revamp of the Old Skool called the Sk8-Hi. Both the SK8-Hi and the Old Skool display the famous Vans Sidestripe which would be carried on to other iterations through the years. In the recent years, the SK8-Hi was consistently being remodeled to cater the needs of skaters depending on the regular wear and tear area or for stability and protection. The Vans design team decided to restore the original format of the Sk8-Hi and include its Style number on its name. The Vans Anaheim Factory SK8-Hi 38 DX gives honor to the factory as well as the first accents of the SK8-Hi. Colorways also resemble the initial look of the coveted sneaker. The color combination for the Vans Anaheim Factory SK8-Hi 38 DX is superbly done which not only emphasizes casual clothes but also brings forth a vintage appeal into the streets. The two-tone concept of the sneaker is complemented by the glossy foxing tape on the midsole. The high-top collar perfectly coincides with skinny jeans but jeans that would cover it would also do the trick. Men can go in shorts here, and women can flaunt this with skirts and dresses. The high-top collar is generously padded and is wrapped by a canvas upper which breathes conveniently. It also features an extended lace enclosure for lockdown reaching the peak. The sneaker is made with a unisex sizing in mind and is available from 6.5 to 13 in men's sizes. Women can go down 1.5 sizes from its male counterpart to acquire their proper fit. The Vans Anaheim Factory SK8-Hi 38 DX has different two-tone colorways which deviate with the original SK8-Hi. It also has a thinner lace bed overlay which extends up to the lateral side of the toe box as compared to the concurrent skate-specific iterations of the SK8-Hi. The foxing tape that fuses the vulcanized construction is much glossier with the Anaheim Factory SK8-Hi 38 DX. Cushioning is provided by the UltraCush sock liners. The sneaker also instills the original drill lining weight of its predecessor model released in the 70s. A signature rubber waffle outsole provides exceptional grip and traction. Vans brandings can be seen at the tongue and the back of the heel.